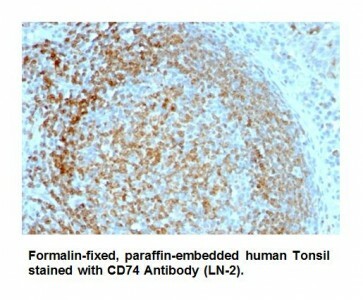 Anti-CD74 Antibody (B-Cell Marker) (Clone LN-2) | A1567 | BioVision, Inc. It recognizes a protein of ~35 kDa, identified as CD74. CD74 is a type II transmembrane protein which binds to the peptide binding groove of newly synthesized MHC class II alpha/beta heterodimers and prevents their premature association with endogenous polypeptides. 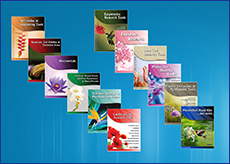 CD74 is expressed primarily by antigen presenting cells, such as B-lymphocytes (from before the pre-B cell stage to before the plasma cell stage), macrophages, and monocytes, and many epithelial cells. 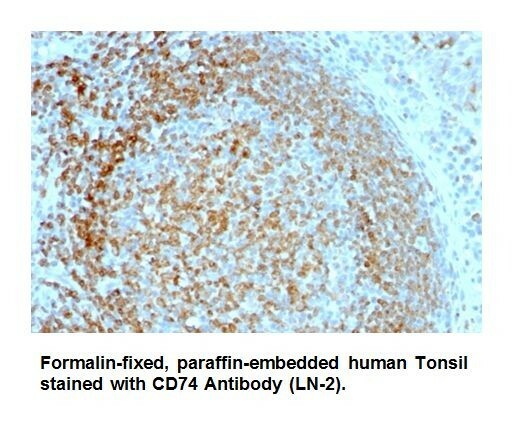 Anti-CD74 stains predominantly germinal center lymphocytes and B-cell lymphomas, but rarely T-cell lymphomas. Anti-CD74 has been shown to be useful in differentiating a typical fibroxanthoma (-) from malignant fibrous histiocytoma (+).